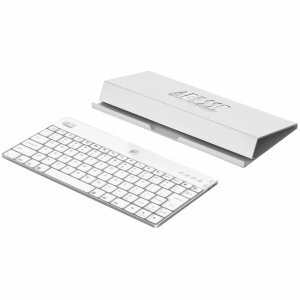 Simply designed for convenience and utility, the aluminum Bluetooth keyboard combined with a cover that converts into a stand holds different sized mobile devices such as the iPad, iPad mini and iPhone. Turn your mobile device into a mobile workstation wherever you are. The slim case magnetically secures and protects the tablet and keyboard when traveling. The low profile scissor-switch keys provide a tactile response for faster typing. At only 6mm thick, the lightweight yet sturdy aluminum keyboard works equally well on the road or in your home office.